ROCK DRUM TRACKS - Hard Rockin' Drum Tracks! HIT THESE LINKS FOR THE LATEST DISCOUNT DRUM TRACK SPECIALS! Welcome to ROCK DRUM TRACKS! Many of you wrote me for a long time wanting drum tracks for your original music. I was able to help a few people here and there, but I had too many things going on to be able to do it on a regular basis. That led me to put out the Complete Drums disc. This is a collection of 16 complete stereo drum tracks in the standard "verse / chorus / verse" format you can use to write with, instead of having to dig through various drum loops and trying to make them fit together and still sound realistic. This has been very popular, and I am continually working on new Complete Drums tracks. (You can download some of the new material here.) Most of my clients use the Complete Drums tracks to write with, and then have me customize the tracks to better fit their song. Email an mp3 of your original material to me at skinbasher@cox.net. Include any notes and suggestions - please be as specific as possible! I will give your track a good listen and email you back with any questions, comments, etc. You then choose which recording option you would like. I offer 2 pricing options which are listed on my recording rates page. (I offer a 20% discount for clients using my Complete Drums material.) Then you pay using PayPal, and we are off and running! Most single track stereo wav file orders (option #1) are completed and posted for you to download within 5 business days. Multiple track orders (option #2) are scheduled per order, with the scratch track emailed to you within the first week of receipt of order. Upon completion of the order, I will upload the finished tracks to my website and send you a link to a dedicated download page. All tracks are 24bit wav files unless you request a different format. 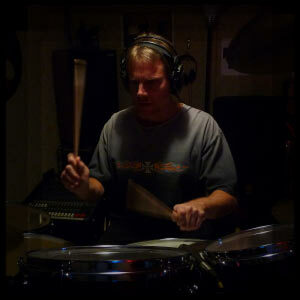 Please see the Complete Drums page for more information on writing music using my drum tracks! If you are interseted in custom backing tracks, email me and let me know what song it is you are wanting a drum track for. I will reply with any questions. Then you pay using PayPal, and I deliver a completed stereo drum track by uploading a stereo WAV file to my site for you to download. That's all there is to it. Most orders are completed within 5 business days of receipt of order. I record custom drum tracks for all standard cover songs starting at my base hourly charge of $24.95. I offer a percentage discount on multiple track orders - I quote the percentage discount per order. You can also order any number of tracks from my recorded inventory (over 200 tracks) for only $4.95 each! No ridiculous pricing, no complex order form, just straight up hard kickin' drums! Drop me an email and let's get started! Click here to download complete drum tracks and free drum grooves!